For the fava fritters: Cook the fava beans in salted boiling water for 2 minutes. Drain and cool. In a food processor, add fava beans, parsley, cilantro, salt, pepper, garlic and onion. Process until it looks like a puree and the herbs are completely processed and mixed in. Pour into a bowl and add flour. Use a spoon to mix well. Heat the oil in a frying pan. Take a little of the fava mixture at a time and shape it into small balls. Fry for a few minutes until golden, but you should still see a few green parts. Drain excess oil on paper towels. For tahini sauce: Add tahini, water, garlic, lemon juice and salt to the food processor and process until you have a smooth sauce. You can add a little more water, a spoonful at a time, to make the sauce a little thinner. Place the fritters on a plate, insert toothpicks on top and serve with a side of sauce. You can serve these delicious fritters with a nice tomato and cucumber salad. You can also serve them inside pita bread. I've been fascinated by Middle Eastern foods and flavors from a very young age. I love their spices and sauces made with tahini, a sort of butter made from sesame seeds that can turn any ordinary dish into extraordinary. I always take advantage of sales at the supermarket, and whenever fava beans go on sale, I make sure to stock up so I can make these light and crunchy bites. 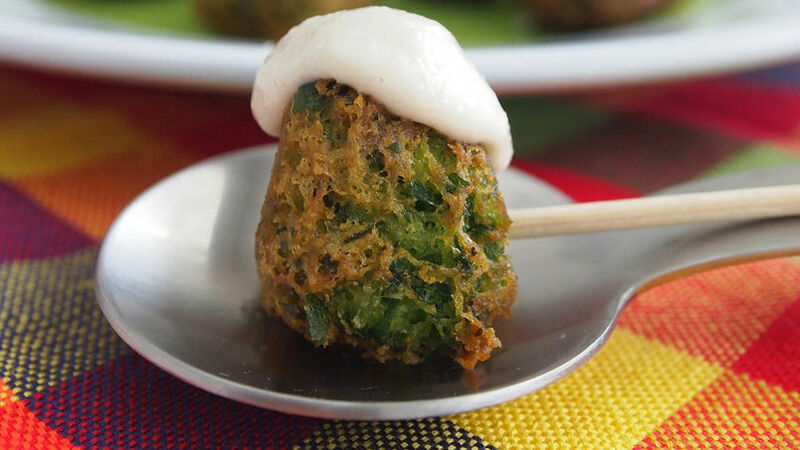 These delicate fava bean fritters are a take on falafel but much lighter because they’re not made with chickpeas. To save time, leave everything ready for the dough, and the sauce can also be made a day in advance.